Iceland has some of the best waterfalls in the world. The terrain is a perfect combination of rugged mountains and melting glaciers in the summer, so there are over 10,000 waterfalls here! I visited Iceland for a month in 2016, and this is a list of my favorite falls in the country. This list is ordered chronologically, assuming you drive the Ring Road in a counter clockwise direction, starting with the southern waterfalls first and then going in a full circle around the entire island, including a stop in the more remote Westfjords and Snaefellsnes Peninsula, until you end up back in western Iceland near Reykjavik. This is what I did on my trip to Iceland, and the driving was a bit exhausting, but the sights along the way were totally worth it! All of the waterfalls on this list are reachable with a normal 2WD car and a bit of hiking. When you’re done admiring the falls from the front, you can walk behind the waterfall for another perspective. Careful with your electronics near the falls, because there’s a lot of mist! Gljufrabui is a neat hidden waterfall that you can reach on a short 5 minute walk from Seljalandsfoss. The falls are hidden inside of a cave, but you can get a closer look by either walking through the opening of the cave OR climbing up above it and peering through an opening in the ceiling of the cave. It’s almost impossible to take a bad photo of Skogafoss. Everything about it is perfect, from the black volcanic sand on the shore, to the solid sheet of water raining down between green cliffs that look like they came from a fantasy movie. The size of Skogafoss is impressive too. It’s about 200 feet tall and 80 feet wide, making it one of the taller waterfalls in Iceland. This is a less known 100 foot tall waterfall near Skogafoss. 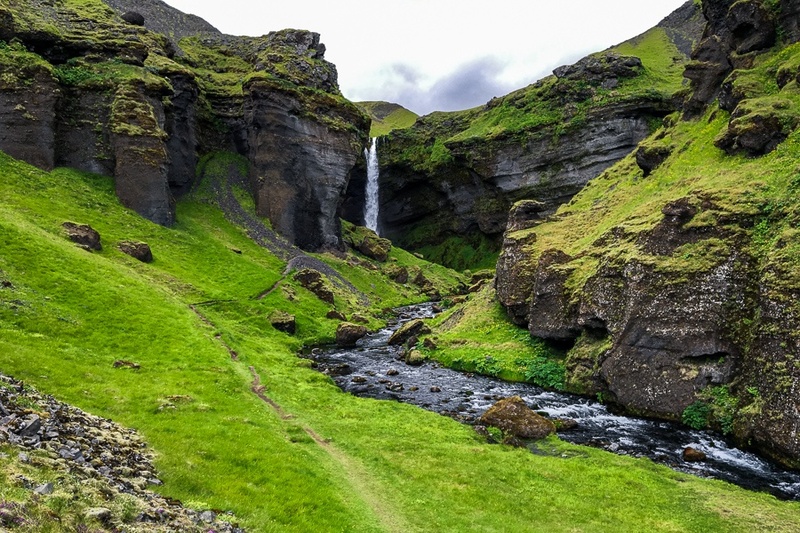 The short hike from Skogar to Kvernufoss is a scenic walking path through an incredible green canyon that looks like something out of Lord of the Rings. The hike to the falls is worth it just for the surroundings alone! This is one of the most unique waterfalls in Iceland. The name Svartifoss means ‘black falls’ and it comes from the dark lava basalt columns surrounding the waterfall. It may look small in photos, but it’s actually about 65 feet tall! Hengifoss has to be one of the most incredible waterfalls in Iceland, although it does have some tough competition from Dynjandi and Haifoss. This waterfall looks like something from Mars. The big lines of red clay sandwiched between the rock layers give it such a bizarre, unbelievable look. It’s also the 2nd tallest waterfall in Iceland, at 420 feet. This is a waterfall you’ll hike past on your way to Hengifoss. Like Svartifoss (#5), this is another waterfall surrounded by weird looking basalt rock columns. This is a great waterfall that looks a bit like a twin of Skogafoss, but much less crowded with tourists. Just like Skogafoss, it’s a big waterfall pouring down into a rocky stream, and you can do a short hike up to the top of the waterfall if you’d like. This is the most powerful waterfall in Europe and it’s fed by a huge glacial river. The chaos and sheer volume of water pouring through here is crazy to watch. Don’t go too close to the edge like I did! I couldn’t resist getting a better look. Dettifoss is about 105 miles (170 km) east of Akureyri, and only requires a 40 minute detour from the Ring Road, so it’s not difficult to visit if you make it over to eastern Iceland. The medieval leader of Iceland symbolically threw the old Norse idols into this waterfall when Iceland converted from paganism to Christianity. The name Godafoss comes from this story and it means ‘waterfall of the gods’. Godafoss is a group of falls joined together into one horseshoe shaped waterfall with awesome blue colors that look a bit unreal. It looks kind of like a mini Niagara Falls, doesn’t it? Godafoss is located about 30 miles (50 km) east of Akureyri in northern Iceland. It’s right near the Ring Road, so it’s a no-brainer to visit if you’re in eastern Iceland! This is one of the biggest and most impressive waterfalls in Iceland. It looks like a thousand little waterfalls combined into one huge waterfall flowing over the rocks. The height is 330 feet and it is LOUD. You can hear it from the parking lot, half a mile away. Dynjandi is located in the Westfjords, making it one of the more remote waterfalls on this list. It’s about 220 miles (360 km) north of Reykjavik, and you have to drive on some steep and scary roads in the fjords, but it’s still possible to reach it with any 2WD rental vehicle. If you’re feeling up for the challenge of getting there, this really is one of the best waterfalls in Iceland. Can you see tiny me in the picture below? Kirkjufellsfoss is an iconic waterfall. Nothing screams ‘Iceland’ quite like this view of the green mountain and three mini waterfalls. The name for this waterfall means “church mountain falls” and it comes from the peak in the background that is shaped kind of like a church. Personally I think it looks more like a wizard hat, which would be fitting because this location also looks like a scene from Lord of the Rings. I think Bruarfoss wins the award for bluest waterfall in Iceland, and possibly in the world. It’s a pretty simple waterfall running into a crevice in the rocks, but you have to admire the colors of the black volcanic rocks mixed with the perfect blue glacier water. It’s just unreal. Gullfoss is part of the Golden Circle, one of the most popular tourist routes in Iceland. This is a big waterfall that goes down in two steps and has a bunch of different viewpoints. This one is only a 1.5 hour drive from Reykjavik, so that’s partly why it’s one of the most famous falls in the country. Haifoss is easily one of my favorite waterfalls in the whole country of Iceland, but it’s also one of the harder ones to reach. Don’t let that hold you back! The main waterfall is 400 feet tall, making it the 3rd tallest waterfall in Iceland. There’s also a second (huge) waterfall running into the same canyon, which is a pretty impressive canyon in itself. The resulting panoramic views you can get here are mind blowing.